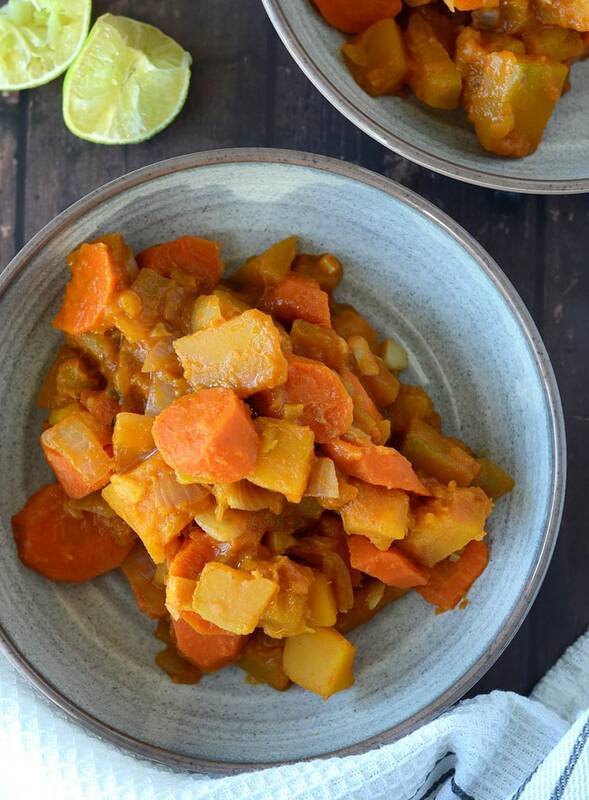 Vegan Kabocha Squash Red Curry - Creamy, Low in Fat, Easy to Make! This kabocha squash red curry is everything you want it to be: ultra creamy, slightly sweet and just absolutely delicous. 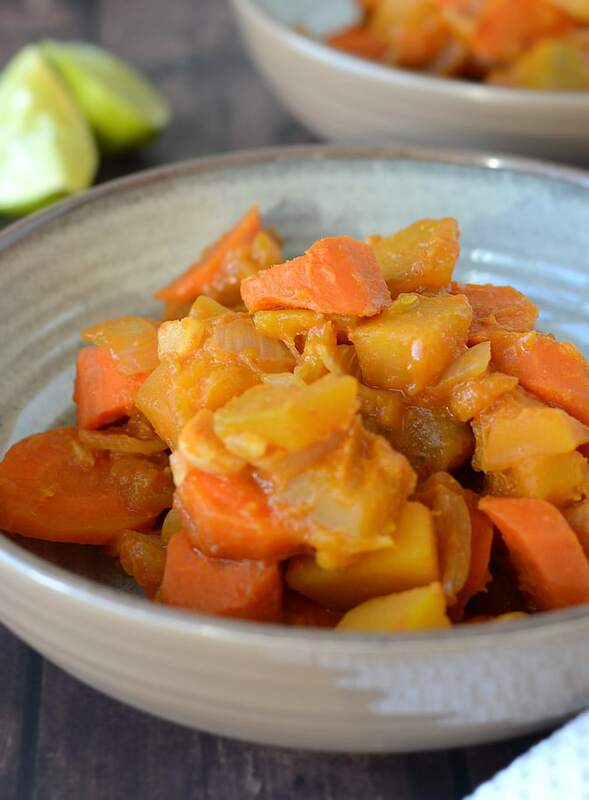 I’m totally hooked on this yummy way to use one of my favourite winter squashes. Easy to make and ready in about 30 minutes, this low fat red curry dish can be whipped up in no time for a healthy, weeknight dinner. It’s also wonderful if made ahead of time as the flavours only improve the next day. There are so many healthy, nutrient-rich winter squashes in season right now. Butternut, spaghetti, kabocha and acorn are the most common and aside from the spaghetti squash they’re all interchangeable in recipes. I almost always make squash as part of my winter season food prep routine. I rotate between butternut, acorn and kabocha and I always make a spaghetti squash. 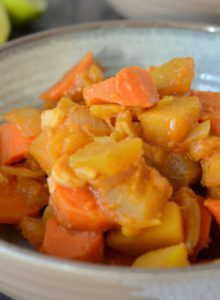 Sometimes I just roast them on their own, a lot of the time I”ll make a soup or stew with them and other times I’ll use them in various recipes like this Creamy Curried Butternut Squash Stew or this Squash and Broccoli Salad. Depending on the amount of effort I want to put in and what I’m making, I may or may not peel squash before cooking it. The skin comes off so easily once it’s cooked, it’s not always necessary to peel it before hand. If I’m cubing squash for a recipe or soup though, I’ll always peel it before use. Kabocha squash is an awkward shape and it’s skin is quite tough so it can be a little tricky to peel. For this recipe, I cut it in half, scooped out the seeds then cubed it and sliced the peel off each piece. I don’t usually peel kabocha squash before baking it for this creamy red curry it was worth the extra effort. I’m in love the flavour the sweet kabocha squash adds to this recipe, I’ve made this the last 3 weeks in a row for food prep! Plus, as it cooks, the squash becomes so tender it adds a beautiful creaminess to the dish without any added fat. 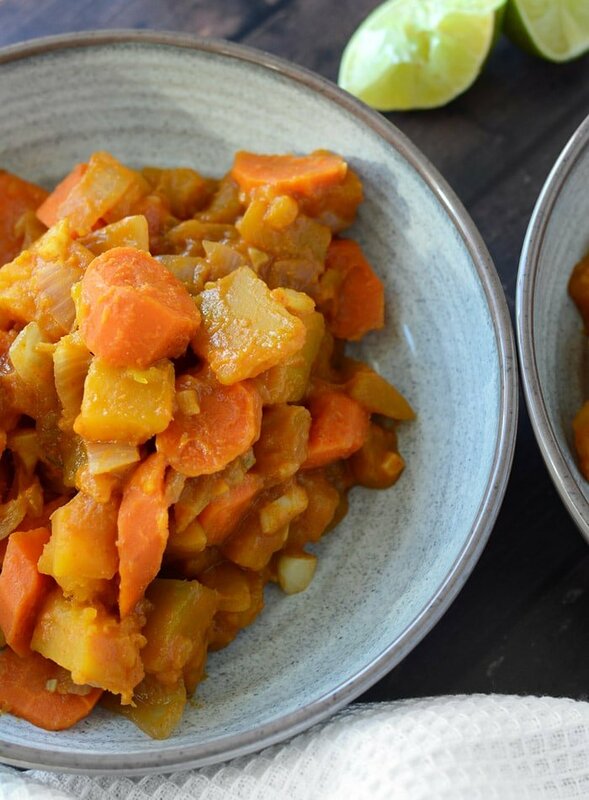 The sweet flavour of kabocha squash is amazing combined with other vegetables and tangy red curry flavour. 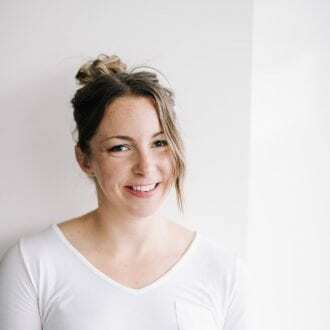 I made this recipe with unsweetened almond milk to keep it virtually fat-free however it could also be made with light or full-fat coconut milk. Either would be delicious and only add more flavour and creaminess! If you’re looking for a red curry paste that doesn’t contain any seafood, Thai Kitchen Red Curry Paste is a good option. You can increase the protein in this dish by adding your favourite protein source. Some baked tofu, chickpeas or lentils would be delicous, simply stir them in as it’s finishing cooking. I eat this as it is but if you’d like to serve it over rice or noodles, I’d recommend using light coconut milk and adding about 1.5 cups so you have more creamy liquid to spoon over your rice. 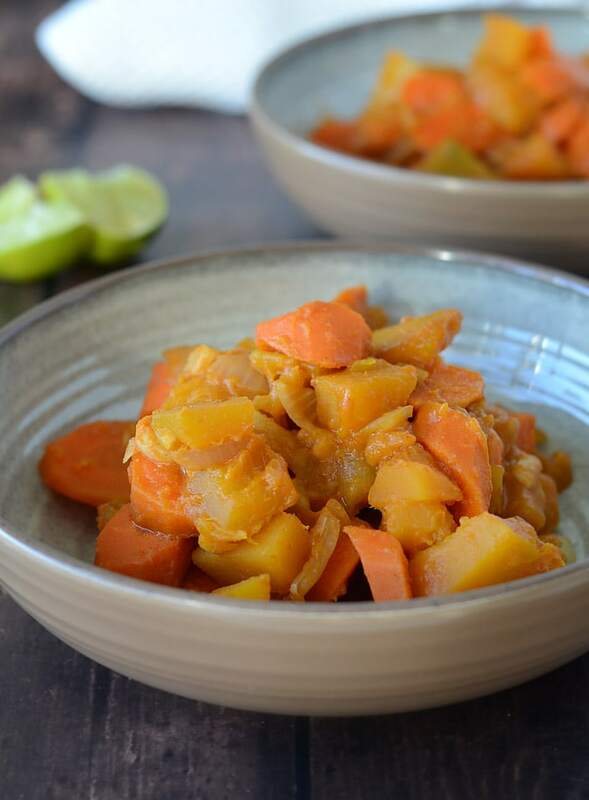 You could also remove a spoonful of the cooked kabocha squash and blend with some almond or coconut milk for even more creamy, red curry sauce! Add the onion and garlic to a large pan and saute in a bit of water, stock or oil until starting to soften. Add the rest of the ingredients and bring to a light boil, giving it a stir every few minutes. Reduce heat, cover and lightly simmer for 20-25 minutes, removing the lid for the last 5 minutes to allow it to thicken. If you want to serve this over rice, I’d recommend using light coconut milk and adding about 1.5 cups so there’s a little more creamy liquid to spoon over your rice! I made this the other night and my entire family loved it – They actually cleared the plate! I only had unsweetened vanilla almond milk on hand, so I substituted it for vegetable broth. As it was running really low on liquid, after simmering for 5 minutes, the liquid was all gone so I placed it in the oven at 350F for 20 minutes and mmmmm! So good!! Thank you so much! !